Spring is finally here and what better to do than to have some raised garden beds! 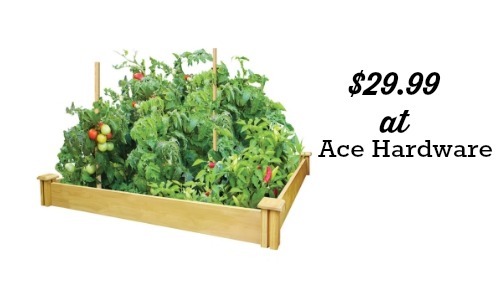 Some stores have nice pre-made raised garden beds and you can get one at Ace Hardware for $29.99! These cedar garden beds are perfect for your gardening needs and measure 48 inches wide and 48 inches long. They are really easy to put together and can be stacked or added onto if you buy more than one. You can have the garden beds shipped to your local store for FREE. Lowe’s has the same size raised bed for $44.48. If you’d like to learn more about raised bed gardening, read my post on how to garden in small spaces.